Most of the time being called strange is not a good thing. But for Liberty Mountain Snowflex Centre, the unusual is drawing national and global attention to the increasingly popular year-round attraction. Popular Mechanics has named the Centre among “The World's 18 Strangest Ski Resorts.” Liberty’s high-performance playground made the list alongside slopes in Austria, India, Chile, Hawaii, Canada and Colorado. Located atop Liberty’s serene 5,000-acre mountain, the Snowflex Centre is the only snowless ski slope of its kind in North America. 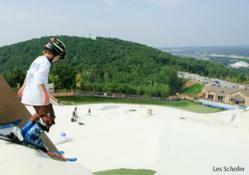 The facility opened in August 2009 and is the country’s premier point for year-round skiing, snowboarding and tubing. It features a beginner slope, intermediate slope and advanced slope, and a two-story lodge.